We have a band of approximately twelve local ringers who maintain ringing for all regular Sunday services, weddings, other special occasions and our Monday night practices from 7.30 till 9.00 p.m. However some of our ringers are attached to other churches locally, mainly East Malling and Mereworth and therefore we continue to be grateful for their willingness to support us at St Mary’s and for the bells to be continue to be rung as they have been for centuries. Of particular note, in 2012 to celebrate the Queen’s Diamond Jubilee, we successfully gave a world premiere to the new Malling Jubilee Peal. 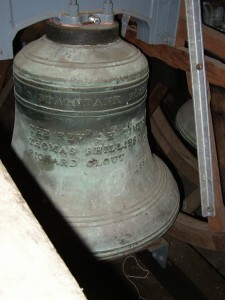 Composed by Daniel Brady, the peal consisted of 5,040 changes of ‘plain bob triples’; a change method for eight bells with the Tenor bell providing the ‘punctuation mark’ each time after the other seven smaller bells ring! Just occasionally we are only able to ring four bells on Sunday morning but normally we are able to ring on six bells and, more rarely, on all eight bells. To be able to make best use of all eight we need more, local ringers. 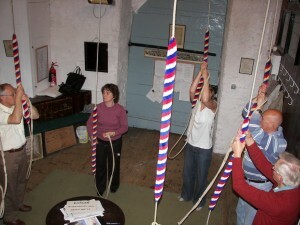 Anyone who may be interested in bell ringing is very welcome to come along on any Monday evening between 7.45pm and 9 pm to see what goes on and give it a try. Anyone from about the age of 12 can learn to ring and there is no upper age limit.